Improving cell phone reception for voice and data in buildings and mass transit is essential for consumers, businesses and wireless carriers. As more people use their mobile phones at work, home, inside commuter trains and elsewhere, cell phone signal boosters have become critical. Cellular Specialties (CSI) helps wireless carriers improve mobile phone signal strength, voice quality and wireless data quality within buildings and inside moving vehicles. CSI supplies cell phone extenders, repeaters and other cellular equipment to U.S. wireless carriers (AT&T, Verizon Wireless, Sprint, T-Mobile and others) that boost wireless reception for customers. The CSI Product Division specializes in the development of in-building amplifiers, repeaters and a variety of system components. The company became the preferred repeater vendor for all U.S. wireless carriers after introducing a cell phone repeater that exceeds industry standards boosting mobile phone signal strength. CSI markets its products primarily within North America, although its cellular solutions are available through resellers in China, as well as Latin and South America. Visit CSI on Twitter for further information. Scott Goodrich, who leads the Product Division at Cellular Specialties, is President and co-founder of the cell phone reception company. 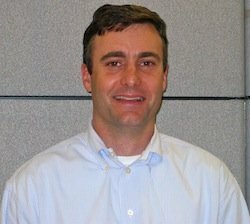 A telecommunications industry veteran, Scott has over 11 years experience delivering in-building wireless products and services. He also co-founded Wavelink Communications, a wireless communications company responsible for the early funding of CSI. Previously, Scott worked in Sales and Marketing for Nextel Communications, Open Development Corporation and Vedas Systems. He’s a graduate of Northeastern University with a BS in Marketing. In the podcast interview with Brian Prows, Scott discusses cell phone repeaters, boosters and other cellular products for wireless carriers that improve cell phone signal strength for all U.S. carriers. In particular, Scott points out the differences between voice and data demands on cellular networks affecting cell phone reception.